In the past week we finished most of the work on the Virus Support Structure (VSS) and on Friday were able to have the first rotation including the new air bearings under the VSS. 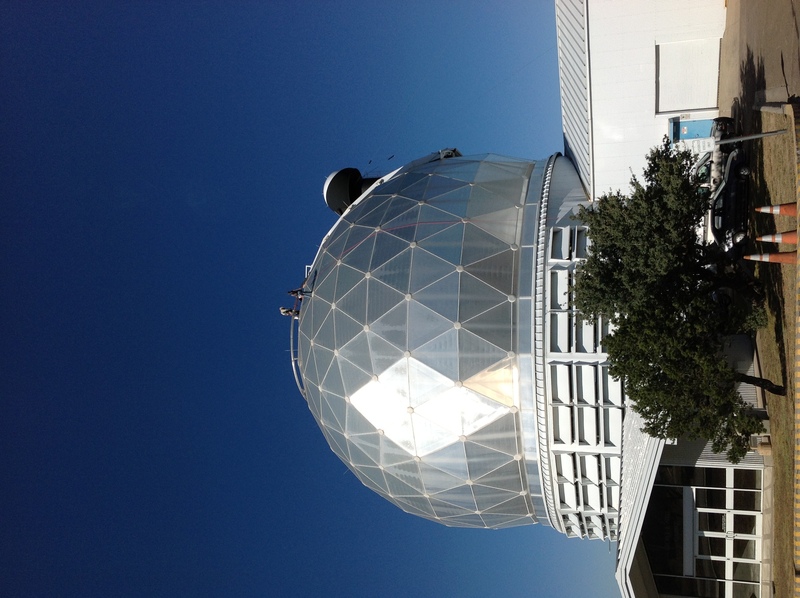 In addition, we had some of the team working on sealing the dome enclosure. Vicki worked on the outer vents at the base of the ring wall and Logan and Kathryn worked on the dome and sealed the nodes near top. This week we will be finishing the clean up of the upper hex removing the trollies, encoders and last of the interconnects. 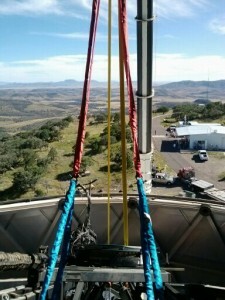 We will also make room for the new JLG man-lift (we call Jr.) on the dome floor. This work is in preparation for the work that John Good will start in Nov. This entry was posted in HETDEX, VIRUS, WFU on October 31, 2013 by shetrone. This past week we worked on getting the Virus Support Structure (VSS) cross supports and over-turn preventers welded into place. Other activities included test digs around the location of the liquid nitrogen tank and the vault for the remote thermal area, setting up the air system for the VSS and continued work on the cable-ways for the lower electrical room. This next week we should finish the VSS work which means that we should be able to unlock structure rotation. If all goes well we will now have the Structure firmly welded to the VSS and they should rotate together as if they were one system. This entry was posted in HETDEX, VIRUS, WFU on October 18, 2013 by shetrone. In the past week we had great guys from Crane Services out to the HET to remove the old tracker bridge from the dome, move the new lower X and upper X assemblies onto the dome floor, and move the VSS into place. It all went very smoothly and they finished on Thursday about 1 hour before a small windstorm (by West Texas standards) moved in. and here is a picture of the tracker removal taken from Renny Spencer who was purposefully stranded up on the upper X beam to monitor the lift. This next week we will be tuning up the VSS, putting in the diagonal bracing and getting ready to hook it up to the air bearing system. Other work at the HET includes putting in cableways in the lower electrical room and spectrograph room, stripping the old coating from the primary mirror segments that were removed before the upgrade began, and applying extra sealant to the dome nodes. This entry was posted in HETDEX, VIRUS, WFU on October 12, 2013 by shetrone. 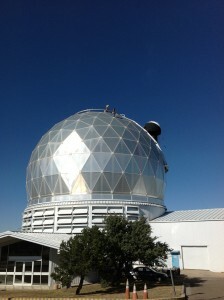 Last week we finished the painting of the CCAS tower and the removal of the equipment on upper X hex. This week we will expect a crane to arrive on Monday and from Tuesday through Friday we will be removing the old tracker bridge, install the Virus Support Structure and stage the upper and lower X rail assemblies for the new tracker onto the dome floor. The upper and lower X rail assemblies will be shipped from CEM in Austin to McDonald on Monday so that they will be on site Tuesday morning. The road to the top of the mountain will be closed to non-essential personnel. We are still on schedule. This entry was posted in HETDEX, WFU on October 7, 2013 by shetrone.